Established in the year 1955 as a game sanctuary, Ranthambore National Park is one of the most popular places to visit for wildlife lovers. In 1972, the commencement of Project Tiger took place. Ranthambore received the status of a national park in the year 1980. At this point of time, Ranthambore National Park was conferred the status of a tiger reserve in the country. It is spread on an area of 1,334 square kilometers along with its neighboring sanctuaries- the Kaila Devi Sanctuary and the Mansingh Sanctuary. 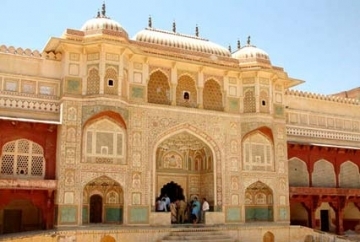 The nearest airport from Ranthambore is Jaipur, which is about 160 km away.You can arrive in Jaipur by flights from all major cities in India. Sawai Madhopur Railway Station is nearest railway station located 11 km away from Ranthambore National Park.All major trains that links Sawai Madhopur cities like delhi, agra,jaipur etc. Ranthambore National Park was established in the year 1955 by the Indian Government. Later it was declared as Project Tiger Reserve in 1973. This world class national park derives itself from the name Ranthambhore Fort located close by. Ranthambore National Park is regarded as one of the best national parks in India. 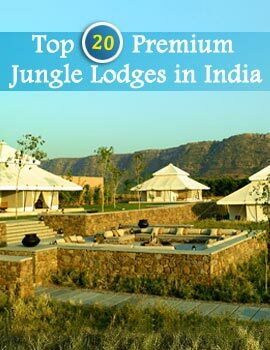 Enclosed by Aravalli and Vindhyas hill ranges it thrives with wildlife. This renowned national park is situated 14 km away from Sawai Madhopur, eastern district of Rajasthan in India. As a matter of fact, the sanctuary of Ranthambore forests was previously a private hunting ground of the Maharajas of Jaipur. Ranthambore was enlarged by the inclusion of Keladevi & Sawai Man Singh Sanctuaries. In the year 2006, Forest department expanded Ranthambore Tiger Reserve granting approximately 1700.22 sq. km. What is the national park famous for? Spread over area of 282.03 sq.km including deep forests, canals and waterfalls, the national park has unforgettable tourist spots including narrow valleys, crystal clear ternary lakes, deciduous forests and much more. The Padam Talab, Raj Bagh Talab and Malik Talao are the famous lakes in the area. Ranthambore National Park is most visited national park in India for photography of tigers. Multiple other species can be spotted such as reptiles, crocodiles, leopard, hyena, jackal, caracals, jungle cat, rattle and much more. There are also more than 300 diverse varieties of birds in Ranthambore National Park. Ranthambore Tiger Safari Canter is one of unmatched safari style to watch exotic wildlife. Mostly, wildlife lovers prefers to go on Canter Safari as it has capability to accommodate 16-20 people. It proffers unique sightseeing experience of exploring the magnificent vicinity of the park. You can avail benefit of this safari early in the morning or late in the afternoon with naturalist. It is one of the most popular options to spot animal movements and appreciate beautiful landscape of the park. The car can accommodate up to 6 people at a time. One can enjoy awe-inspiring experience of Jeep Safari in Ranthambore either in morning or afternoon. 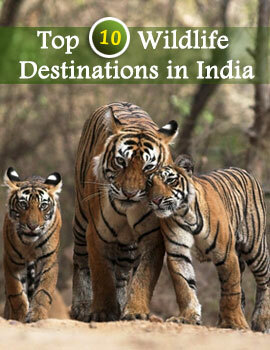 There are mainly 10 different safari zones for tourists within Ranthambore Tiger Reserve. If you are seeking to book online safari tickets for majestic Ranthambore Tiger Reserve Sanctuary, then surely choose favorite safari zone as per convenience. 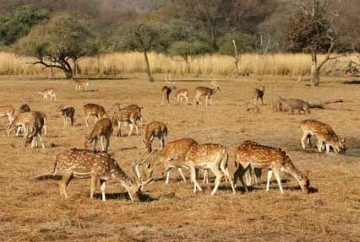 During the zone you can go anywhere on the network that suits you and will have golden opportunity to sightsee Sambhar Deer, Indian Gazelle, Blue Bull formerly known as Nilgai, Spotted Deer, Monkey and multiple other diversified animals. Zone 1:- This zone is very popular for buffer zone which is home to T-39 and T-57. The zone is renowned to Noor zone T-39. Places where you can spot are: Tuti ka Nalla, Amreshwar Dang, Sultanpur, Peela Pani and Gada Dub. Zone 2:- Renowned zone for popular sightings as water holes and cats in this zone are T19, T22, T72, T57, T28, T60 and T39. Places where you can spot are: Jogi Mahal, Phuta Kot, Phuta Bandha, Lahpur Tiraha, Nal Ghati. 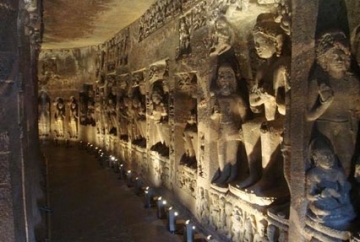 Zone 3:- Raj Bagh, Jogi Mahal, Padam Talab, High Point and Mandook are major points for sightseeing. Zone 4:- It is the most famous zone for Tigress of Ranthambore. Other cats seen in this zone are T-28, T-64, T-19, T-75, T-41 and T-25. Zone 5:- Big cats spotted in this zone are T-25, T-28, T-17, T-74 and T-75. Zone 6:- Most popular points for the tigers spotted in this zone. Other Tigers spotted in this zone are T-34, T-39, T-57 and T-8. Zone 7:- This zone has fewer points compared to rest zone as bigger cats spotted here are Chidikho, Jamoda, Kushalipura, Rajbagh Naka. Zone 8:- Famous spots in this zone are- Balas, Kherai, Kali, Neemli Dang, Bhat, Mahakho. Zone 9:- This zone is about 45 minutes away from Tiger reserve sanctuary located at majestic Chakal River. Caracals, Sloth Bears and Aquatic birds are major animals spotted here. Zone 10:- Tigers spotted in the zone are Aantri, Kushalipura, Bodal, Halonda and Banskhroi. Other spotted zone include T-13, T-42 and T-43. Opened During-1st October to 30th June. Closed During-1st July to 30th September. The winter season from October to March is the most chosen season to visit the majestic Ranthambore National Park. Tourists can enjoy pleasant weather and bustling greenery after monsoon which attracts tourists frequently. Glorious flowers adds luster to the area around water bodies. Moreover, remarkable migratory birds visit this majestic national parks. This can really become eye-catching for all tourists who have interest to take snapshots of the charming birds. Also, it is suggested to carry enough winter clothes during midwinter season for better exploration. Expect extreme heat with temperatures ranging between 35 °C - 47 °C. Moreover, this is the ideal time to spot tigers close to the lakes, visiting to quench their thirst. The temperatures are high and unbearable but mornings are amazing to go on safari as well as indulge in wildlife photography. By Air- Jaipur International Airport located 180 km from Ranthambore National Park is the nearest airport. You can arrive in Jaipur by domestic flight from all major cities in India as well as international flights. By Rail- Nearest railway station is Sawai Madhopur Railway Station which is 13.8 KM away via Ranthambhor Rd/Sherpur Rd. You can definitely hire a cab or bus services from Sawai Madhopur Railway Station. By Road- It is interconnected to major cities and towns via various means of transport. You can easily reach through private buses and taxis from Delhi, Jaipur, Ahmedabad, Ajmer and Jodhpur.